First things first, however: before even venturing into such shams, we can start by placing the credible ones on the spotlight. Knowing and understanding the better brands to go for will be of much use to you in developing appreciation to the bed industry as a buyer than knowing the counterfeits. One such brand that has continually impressed the general public and most customers is Layla! Brothers Mohammed and Akrum Sheikh outdid themselves in the spring of 2016 when they first introduced this bed-in-a-box mattress to the industry. There was a lot of skepticism at the time on the viability and applicability of the technology in delivering sales. Nonetheless, the years have proven more favorable to the duo as the company is now a booming mattress business. I bet you are wondering what set aside this brand from the hundreds more to be found online making it a market leader in just 2 years! The first thing any buyer should know when looking for a bed is the construction and design before even asking about the price. The construction determines the comfort levels as well as the firmness of any bed. Layla is made up of 4 layers with each serving a different function. The top 3” layer is made of memory foam and infused with copper gel to provide the buyer with a rapid heat transfer. This first layer is also made in a way that it offers deep compression support with a med-soft comfort. It doesn’t end there; you will be pleased to know that this layer also has antimicrobial features – you can rest knowing your health is intact too. The second layer is 2” convoluted support foam of 1.8lb density. This layer is specifically meant to allow for maximum airflow further enhancing the sleep-cool experience. Next is a 4.5” base support foam layer followed by a 1” copper infused memory foam layer. This construction design is what makes the bed flippable enabling it last longer as buyers enjoy the best of both sides. The first thing you notice immediately the bed is delivered to your doorstep is the fancy box feature which minimizes your luggage. You are required to unbox in the exact room you want the bed to be in to reduce the hassle. Make sure your eyes don’t pop as you maze at the technology as you watch it expand. You can then try out your mattress for the next 120 nights as you decide whether it suits your sleeping needs. Layla mattress has been associated with a sleek edge support that greatly minimizes complaints from Layla fanatics. 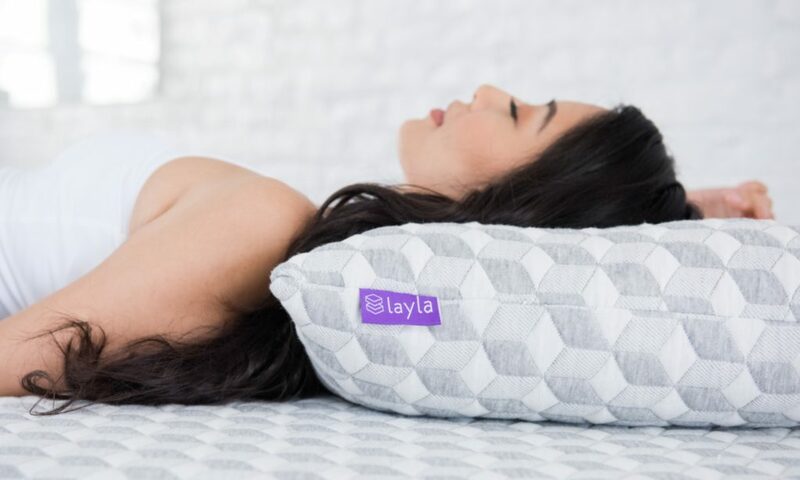 What’s more, the memory foam make ensures a high level of motion transfer: as a matter of fact, more couples are recorded purchasing from Layla than singles do. The fun train still continues; how about topping up a lifetime warranty to all those features! When you have a bed that offers you an absolutely cool night coupled with comfort levels to die for and a lifetime warranty, I don’t really know what more you could possibly ask for. It’s important, nonetheless, to try out the bed with your sleeping position to know if it really works for you. If you opt to on a relatively firmer surface, however, you can try flipping the mattress to the firmer side – kill two birds with a single throw!